Before I saw The Curious Incident of the Dog in the Night-Time, I couldn't fathom how they were going to turn one of my favourite books into a play. This is why I don't work in the theatre. Curious Incident translates wonderfully to a live audience and is so full of humour and high emotion that it is captivating and all-consuming. 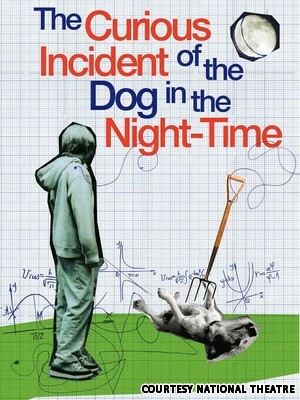 Based on Mark Haddon's award-winning novel of the same title, The Curious Incident of the Dog in the Night-Time tells the story of Christopher Boone, a fifteen year old boy with severe learning difficulties (usually labelled Asperger's Syndrome), as he tries to solve the mystery of who killed his neighbour's dog. It is always going to be a challenge to make an autistic character connect with an audience, because that is the nature of their difficulties. However, Luke Treadaway's honest and moving performance combined with wonderfully creative direction threw me, sometimes painfully, into Christopher's mind. The audience was riveted, everyone leaning forward in their seats, stiff with the tension – which was broken often by Mark Haddon's heart-breaking humour superbly delivered by an outstanding cast. I thought the set was particularly ingenious. The Cottesloe Theatre is in the round and the square floor space is marked like graph paper, allowing for different squares to be lit up to outline rooms, but also for Christopher's diagrams of maths problems to be drawn on the floor in chalk or highlighted with spotlight effects. My favourite scene was when Christopher was at the train station. The choreography and the use of lighting made the scene terrifying and it became very easy to understand how overwhelmed the character felt by a situation many of us face every day. Not only is it an excellent portrayal of Haddon's creation, but it also encourages awareness of a very misunderstood condition. As a Haddon worshiper, I couldn't give Curious Incident any higher praise. Why? Curious Incident translates wonderfully to a live audience. Where: National Theatre, South Bank, London, SE1 9PX.